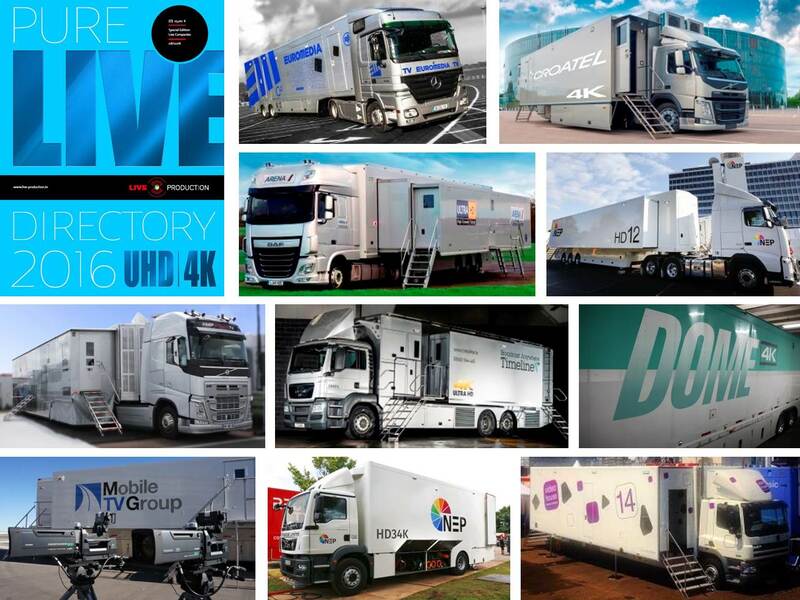 PURE LIVE 2016 presents 24 UHD/4K trucks in quite detail. Although HD productions still represent the vast majority of sports and show events today, 4K is undoubtedly on the horizon. Content producers are looking for solutions that serve their needs today while they prepare for future 4K needs. However the Sky Q platform in the UK plans to produce 124 Premier League matches in 2016/17 while BT Sport continues to broadcast football and rugby matches in addition to UEFA Champions and UEFA Europa League matches and other live events like MotoGP races. .
AMV offers a full spectrum of production services, including a fleet of mobile production units that regularly provide the path to television for major events including the Macy’s Day Parade, the GRAMMY® Awards, MTV Movie Awards and many others. Zurich is one of the few remote trucks in the country to adopt IP networking. Zurich, was at The Forum to generate the live broadcast to iHeartRadio’s digital platforms while also shooting and archiving Ultra High-Definition video of the show to meet future demand. AMV is excited to introduce the newest member to their Mobile Fleet. In cooperation with Slovak partner ELEKTRONIKA a.s. Broadcast Solutions designed a customized variant of its Streamline S16 OB Van which was built in short time and delivered to the customer within three months from commissioning. Part of the delivery was a supporting van to accommodate tripods, cameras, cable drums, etc. With the contract for broadcasting the Czech premier football league granted to O2 Czech Republic EMP1 was built espacially for this purpose. The 16-camera HD OBVan will help to implement the visions of the newly founded division O2-Elastic Mediato the Czech football league. Broadcast Solutions GmbH has delivered a 31 camera OB Van plus supporting truck to sports channel Al Kass in Qatar. The live production vehicle named OB-10 is the biggest addition to Al Kass’ OB Van fleet and will serve in major live events for the Al Kass sports channel as well as for further TV stations, when Al Kass acts as broadcast service provider. Al Kass can draw on 31 cameras, 9 EVS XT-3 servers (12 channels each), 68 monitors and 240 multiviewer screens for up to 29 operators working in the OB Van. To provide enough space for all equipment and manpower Broadcast Solutions opted for a trailer design with a single expansion (1.6m) over the full length of the trailer. Nova TV, a commercial national television network in Croatia, and part of the CME Group (Central European Media Enterprises), has installed an SSL System T broadcast audio production environment into its new 27 tonne mobile production vehicle, HD OB VAN 3. The new truck will mainly be used for Nova TV productions, and has already been in action on several large-scale broadcasts including the Croatian version of Your Face Sounds Familiar (Tvoje Lice Zvuči Poznato), the Ultra Music Festival in Split (large dance music festival), and several big sporting events. At 14 meters long, 4 meters high, and 4.7 meters wide with its double width extensions, the truck is equipped for the most complex productions. It has a 16 cameras ready to go, including specialist super slow-motion and steady-cam hardware, and a large video production gallery. EVS’ DYVI switcher has been chosen by renowned Hollywood film director Francis Ford Coppola for use on his ambitious Live Cinema project, ‘Distant Vision’. The DYVI IT-based switcher, which is usually part of a television broadcast environment, was used to cut together feeds from the 40 cameras, which captured the live production-film hybrid. ‘Distant Vision’ is a traditionally-scripted story that is rehearsed and blocked before being performed live and broadcast in real-time to online audiences. Created by Coppola’s Zoetrope film studio, the first part of the project - which involved the production of a portion of the film’s huge 500-page script - was captured at UCLA. CBC’s Studio 42 at Maison Radio-Canada in Montréal is to Canadian television what a legendary room like Studio 8H in Rockefeller Center is to US broadcasting history. Coincidentally first opened 42 years ago, the flagship studio has been used for countless awards ceremonies, talk shows, concerts and other live-event programs over its four-plus decades. Earlier this year, “Le Studio,” as it’s known to millions of Canadians, underwent a significant technical upgrade. Included in that was a new sound systems for Studio 42’s audience seating, and for the Grand Dame of Canadian broadcasting, only the best would do—L-Acoustics ARCS WiFo, which Radio-Canada Systems Designer Michel Desjardins first heard at AES 2015 in New York City. PBS member station WGBH in Boston is using a purpose-built fiber-transporter caddie from JE to deliver TV and radio signals between its new remote studio at the Boston Public Library and the main WGBH facility seven miles away. The custom JE transporter caddie makes it possible for WGBH to broadcast from the new studio by carrying all A/V, ancillary, and data signals in both directions through one self-contained product. WGBH has full-duplex connectivity that allows operators to manage four cameras with full robotic control; two separate Gigabit Ethernet paths; return video and audio for PA, intercom, IFB, reference, and monitoring; GPIO; DMX lighting control; and all microphones for radio and television, the audio from which is brought back to the station in separate tracks and then distributed within the WGBH facility. The Games organisers reported that, on average, the new venues in PyeongChang and nearby Gangneung are 90 per cent complete in advance of 26 test events scheduled between this November and April 2017. PyeongChang will host the mountain events; Gangneung will host the ice sports. PyeongChang 2018 President Hee-beom Lee stated: "Based on thorough preparation, we will strive to provide the best of service to all participants and realise our goal of making the PyeongChang 2018 Games Cultural Olympics, Environmental Olympics, Olympics for Peace and Economic Olympics, and pleasantly surprise the world with our performance." "Beijing 2022's vision of creating a world-class winter sports centre in a region of 300 million people is becoming a reality," Commission Chair Alexander Zhukov said. "It is a formidable opportunity to have such excellent facilities for skiing and other snow sports so close to a major city. "The Coordination Commission members took gondolas to the top snow sports venue cluster in Zhangjiakou after earlier visits to venues for Alpine and Nordic skiing in Yanqing. The Commission also visited Beijing 2022's new headquarters in a converted steel plant on the western edge of the city, and held discussions with the Organising Committee focused on five main topics: governance; sport; venues and infrastructure; commercial; and communications and engagement. The Longines Global Champions Tour (LGCT) is the world’s premier equestrian event series, bringing together the top 30 ranked show jumpers, including Olympic and World Champions, to compete in prestigious locations. Millions of spectators enjoy the thrilling action from the Tour’s 15 stops via the LGCT website, national sports broadcasters or at the venues themselves. German event specialist hippo data, one of the timing and data handling service providers for Longines Timing, has been charged with delivering seamless technical integration for the entire tour for the past four years. Its responsibilities include timing, competitor data and statistics, big screen event coverage and presenter led programming for broadcasters. Swedish communications company Spocks Family, which specialises in storytelling for video production, turned to LiveU to bring the complete 2016 ÖTILLÖ Swimrun World Championship live in high quality to online viewers. The LiveU technology and support was provided by Mediability (formerly AVIT Systems). The ÖTILLÖ Swimrun World Championship offers a tough challenge to participants and an almost equal challenge to anyone wishing to bring the event to viewers. The race started in 2006 and there’s now a series of other races that build up to this event. Involving teams of two people, they swim between 26 islands and then run across them. The 20 metre high by 20 metre wide Monolith is 10 metres deep and was created by production designer Es Devlin working in close conjunction with Beyoncé herself who is involved in all the major details of her stage presentation. It takes the striking beauty, isolation and simplicity of a Monolith design concept to amazing new levels. The object opens 7.3 metres in the middle, tracks – as two sections on sliding grids – and rotates 360 degrees, a feat of engineering enabled by Belgian automation specialist WIcreations who designed the rotation and sliding system for Stageco, who built the moving elements of the stage. The Dave Matthews Band was playing its 25th anniversary tour in the U.S. and Canada this summer. The lengthy annual DMB summer tours have actually acquired legendary status and are known for improvised renditions of their regular songs as much as for their stunning visual shows which have been designed by Fenton Williams since the early 1990s. Fenton and his Charlottesville-based design company Filament Productions are still responsible for the production design and this year he and co-lighting designer Aaron Stinebrink specified Robe BMFL Spots and PATT 2013 fixtures. The combined strength and stamina of the hundreds of people involved in each complex tower construction was a sight to behold in the electric atmosphere at a packed Tarraco Arena Plaza. Spain’s human-tower building championship is a highly anticipated fixture on the national sporting calendar with Castellers de Vilafranca targeting an eight title. The group, who were founded in 1948, have worked hard to promote Catalan culture around the world and claimed their first Concurs title way back in 1972. This time around, they won with two completed 10 level towers - 3 of 10 with Triple Base and 4 of 10 with Triple Base. Aspire Academy, a renowned football (soccer) training facility based in the Middle Eastern state of Qatar, has made a significant investment in the ChyronHego Coach Paint video telestration tool. Aspire Academy has purchased 10 licenses of Coach Paint for use by its entire coaching staff to teach advanced concepts, reinforce correct technique, simulate game situations, and enhance scout preparation. Founded in 2004, Aspire Academy is committed to finding and developing the best young Qatari athletes while also providing them with a high-quality secondary school education. Based in Lima, Peru, Latina TV called on Lawo and Peruvian systems integrator Telefonica Servicios Audiovisuales to install two 24-fader Lawo mc²36 All-in-One audio mixing consoles and six Lawo Compact I/O stageboxes in six of its studios, along with a single Lawo crystal desk for the press area. This builds on the broadcaster’s positive experience of its mc²36 console. The studio networking is handled by a Nova73 compact, which connects the mc²36 consoles, the crystal desk and three V__pro8 video “toolbox” units that act as the router for integrating the video and audio. This compact, fully digital, 8-channel video processor contains all of the “glue” features needed in broadcast production workflow. Seeing the exciting potential in 4K/UHD technology and wanting to deliver the very best experience for its viewers, BT Sport looked to its key partners—including Arena Television, one of the UK’s leading mobile broadcast service providers—to help realize its vision. Arena chose a solution powered almost exclusively by solutions from Grass Valley, consisting of a resilient, scalable IP core and broadcast-centric edge devices designed to provide the flexibility, responsiveness and reliability required for live broadcast. Arena’s new OBX mobile production unit, the first of three new units planned, provided simulcast UHD and HD signals on an IP network for the historic BT Sport broadcast of the Liverpool vs. Leicester City Premier League match. Hitachi Kokusai has partnered with New World Symphony, an orchestral academy based in Miami Beach, to help transition the live production of its world-renowned outdoor WALLCAST™ concert experiences and other productions to native 4K UHD resolution. Along with Christie projectors, the HITACHI SK-UHD4000 cameras represent the first phase of an end-to-end 4K video infrastructure upgrade at the New World Center, campus of the New World Symphony. The multi-format capabilities of the Hitachi cameras will allow the NWS production team to operate the cameras in 1080p HD mode until the remaining infrastructure, including routing and switching gear, is upgraded to 4K. Grass Valley, is hitting the road for a series of educational events that will give attendees hands-on experience with some of the leading solutions in the market. Each stage of the roadshow will showcase 4K/UHD solutions made possible with the extensive Grass Valley portfolio, which embraces system cameras, production switchers and replay systems. New products on display will include the award-winning LDX 86N 4K/UHD camera and the GV Korona K-Frame S-series production switcher. Each stage of the roadshow will showcase 4K/UHD solutions made possible with the extensive Grass Valley portfolio, which embraces system cameras, production switchers and replay systems. New products on display will include the award-winning LDX 86N 4K/UHD camera and the GV Korona K-Frame S-series production switcher. Established just over two years ago in London’s West End, Celebro Media Studios is specifically designed for live television applications. The studios are used by several global broadcasters, including the BBC, MTV, and TRT World, the Turkish state broadcaster. “The idea is that any client who makes live television can walk into our space and very, very quickly put a live television programme on air.” says Wesley Dodd, CEO of Celebro Media Studios. “We wanted to be at the forefront of technology. Everything from the monitors on the wall to the cables under the floor are suitable for 4K transmissions and this, of course, has been extended to the lighting too."